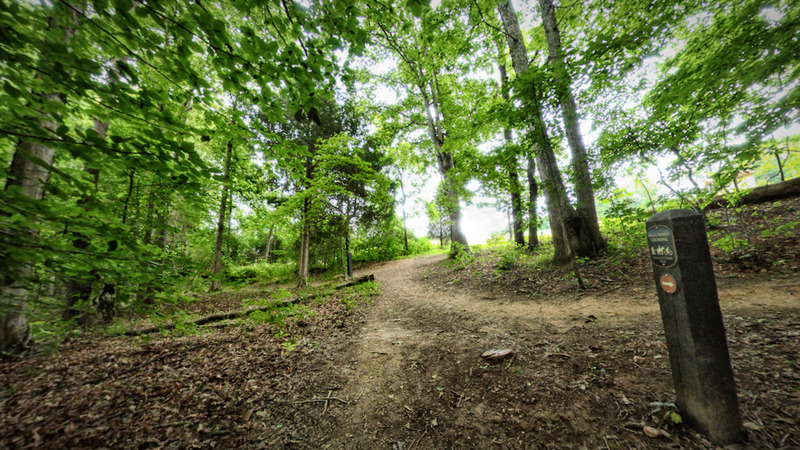 Preddy Creek Trails Park is a 571-acre wilderness park in north-eastern Albemarle County that opened to the public in April 2011. It is the first park in Albemarle County with equestrian trails. The park is located in Albemarle County's eastern rural area, on the north side of Route 641 (Burnley Station Rd) just west of its intersection with Route 640 (Gilbert Station Rd). Parts of the park are in neighboring Greene and Orange counties. The park has 8.6 miles of hiking, cycling, and horseback trails, gently rolling, easy to moderate, free and open to the public from 7 a.m. till one hour after sunset daily. There's also a newly added advanced mountain bike trail. The number of trails continues to grow in Preddy Creek Trail Park, with a strong emphasis on smooth flowing single track over rolling terrain. Preddy Creek Trail is just over three miles long, and the hills are not too steep. It caters to mountain bikers of nearly every skill level. The Preddy Creek Trail loop is a great place to start for beginners with its smooth tread surface, but also presents a challenge for more advanced riders with quick climbs and descents that twist between the trees. It's also perfect for a weekend walk through a; beautiful, traversing mature hardwood forest with multiple grade changes.